HAMPTON, Ga. (July 3, 2018) - The record books keep getting rewritten each week when cars take the track at Atlanta Motor Speedway's 1/4 mile Thunder Ring for Thursday Thunder presented by Papa John's Pizza. While Locust Grove's Bill Plemons Jr. continues to rewrite history as the oldest winner in Thursday Thunder competition, it was last Thursday's finishing order of the Associates Group Young Lions that created a new entry in the Thursday Thunder record books. For the first time in the 21-year history of the series, the top three finishers in a feature race were female. "I thought it was pretty cool," said Whitener when asked about the finishing order. "I never thought that it would happen. It's really rare that girls even win in Thursday Thunder so I thought it was pretty cool to have girls finish 1-2-3." "I realized that it was a 1-2-3 female finish when we were going into tech," said Mohwish. "Because over the raceciever, they told the 21 to go to the start-finish line and the 26 and 18 to go to the tech area. I then realized that 18 was Audrie's number and I was like 'Oh My God, all three girls finished in the top three'." With the division leaders already out of contention from a wreck earlier in the race, the final restart provided to be the difference as it took out the race leaders and opened the door for the trio to get to the front. "It was tough," explained Mohwish describing the final restart. "I remember seeing someone in front of me spin and then going off into the grass and then other people trying to avoid that and them wrecking. Just trying to make my way through all that was really hard. It was pretty difficult because people were wrecking left and right." The chaos of the green-white-checkered finished for the race along with the ensuing wreck following the restart initially clouded the outcome and tempered the excitement of the podium finishers. "There was a wreck the very last lap of the race so we were very confused about the lineup and didn't know if it was going to change or not," said Mohwish. "We didn't want to get too excited, but yeah, after everything died down and we got the final line up we definitely talked about it a lot." "I wasn't really paying attention to who was behind me in the race," said Whitener who was directed to the start-finish line for the traditional post-race interview and front stretch celebration. "So when I came back in, I didn't notice it until right after I pulled in [to tech]. I thought it was pretty cool that we could have all girls come 1-2-3 because it doesn't happen very often. There was a little bit of talk between us, and we all thought it was pretty cool making history." Whitener became just the 14th different female driver to post a Thursday Thunder feature victory at the Thunder Ring. Those 14 drivers have combined for 40 feature victories out of more than 1,200 feature races in the 21 year history of the series. Of the 39 previous wins, never have female drivers finished 1-2-3 nor have they stood 1-2 atop the podium. "The coolest part was just everybody coming up to me [after the race] and telling me that it was the first time that it has ever happened," Mohwish mused. 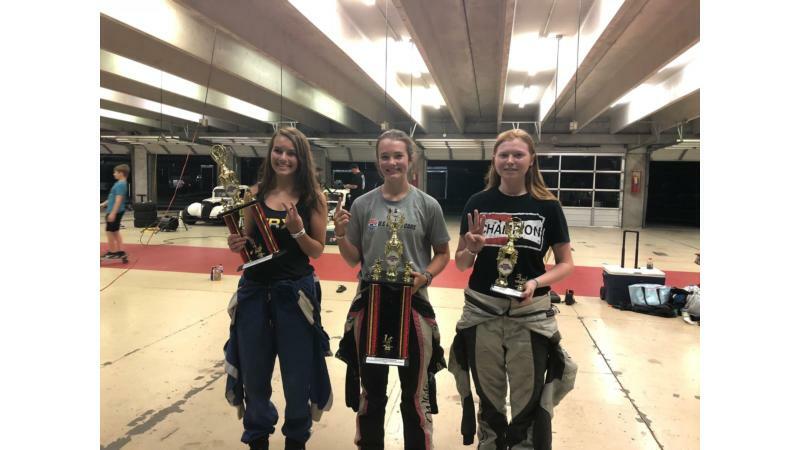 "There aren't a lot of girls in Legends Racing at Atlanta and then having all three girls finish in our class in the top three I thought was the coolest part - and happening for the first time." The 2018 season continues with week 5 action this Thursday, July 5 and will run each Thursday night through July 26, before wrapping up with a special-edition Saturday Championship Night on Aug. 4.